NEW YORK (AP) — About 100 million people faced a new challenge after the whopping East Coast snowstorm: a gusty deep freeze, topped Saturday by a wind chill close to minus 100 on New Hampshire’s Mount Washington that vied for world’s coldest place. On Saturday, winds of more than 90 mph swirled Mount Washington, the Northeast’s highest peak, at a temperature of minus 37 degrees and a wind chill of minus 93. It tied for second place with Armstrong, Ontario, as the coldest spot in the world. A 3-foot tidal surge brought on by the nor’easter along the Massachusetts coast was the highest recorded in nearly a century. Residents of Boston and its suburbs were cleaning up Saturday after the tide that came in Thursday, flooding streets and forcing some residents to be evacuate as the water started to freeze. “My car felt like an icebox this morning, even though I had the heat on full blast,” Julie Williams said as she sipped coffee inside a Jackson Township convenience store. She was headed to work at a local supermarket, and was expecting it to be packed. The operators of New York’s John F. Kennedy International Airport were struggling to recoup from Thursday’s storm. Monday is expected to be the first day above freezing since last month. In New York City, temperatures should reach 40 degrees next week. Even more southern locations didn’t escape the cold; the mercury dipped into the single digits in Baltimore and Washington, D.C., during the weekend, about 20 degrees below normal for this time of year. The high winds and frigid temperatures prompted several ski resorts to close some of their lifts. 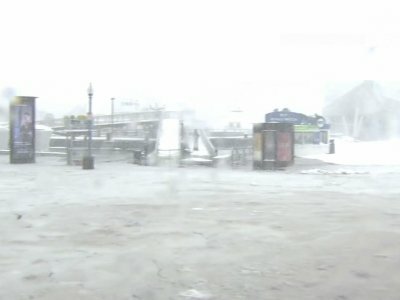 Bolton Valley in Vermont said there was a general “lack of demand and enthusiasm from skiers and riders.” With a temperature of minus 14 at the summit and minus 11 at the base, the resort cancelled evening skiing due to a frostbite warning. In Vermont’s capital city of Montpelier, with the temperature at minus 5 Saturday, business was slow at La Brioche Bakery but soups were a big seller, said bakery clerk Caroline Cunningham. “Nobody wants to be outside,” she said. The key strategy for most East Coast residents was to wear layered clothing. Brooklyn resident Zelani Miah, who was walking home from running errands Saturday morning, said he wore lots of them.